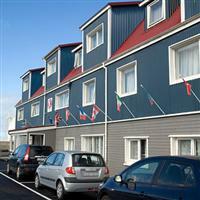 Welcome to a charming waterfront location in the central point of the Snæfellsnes Peninsula, where the Hotel Framnes, Grundarfjorður boasts an enchanting spot in the fishing village. The area is known for its strange light, and offers plenty of magical photo opportunities with its midnight sun, western fjords and ever-changing ocean colours. This former fisherman's hostel now provides visitors with attractive affordable accommodation and the chance to explore the destination at leisure. The beautiful Snæfellsjokull Glacier in the National Park is a short drive away and is surrounded by lava fields, calderas, craters, pebble beaches and lava plugs. Visitors can also enjoy horse-riding, bird watching and hiking within easy reach of the hotel. Staff are knowledgeable and passionate about the area, and will happily endeavour to make your holiday a happy and memorable one. Tranquillity and quality await you as you enjoy spectacular views of the fjord from this seaside location. After your day out and about in the unique landscape, why not return to the soothing pleasures of the sauna, hot tub and massage chair for a great way to unwind. The cheerful restaurant can seat up to 50 guests and serves delicious gourmet seafood, succulent Icelandic lamb and chicken, as well as a range of vegetarian dishes. The hotel is also offers a 100% smoke free environment and complimentary wireless Internet access for those important messages back home.